I sabela, one of more than 8,000 Cuban health workers in Brazil, saw two options when her country abruptly ended the agreement that brought her there: life as a 'slave' or a refugee. She chose to defect because of what she says is a "lack of freedom" to choose where to work, despite the fact her decision is likely to keep her away from her family for years. "We, to them, are like property. Since they trained us, we belong to them," she told the Thomson Reuters Foundation, on the condition that her real name was not used for fear of repercussions. That's a characterization that Brazil's incoming president, Jair Bolsonaro, agrees with. He has called the doctors "slave labor" because the Cuban government keeps about 75 percent of their pay and does not allow the doctors' families to join them in Brazil. His criticism was cited by Cuban authorities as the reason for the end of the program, which provided healthcare to millions of Brazilians. Since the agreement ended, thousands left Brazil in chartered planes, but centers for refugees and lawyers have noticed an increase in the number of Cubans looking for help. "I represent three doctors. Other lawyers in the state represent seven more. We believe this number will continue to rise," said Adriano Pistorelo, a migration lawyer from Centro de Atendimento ao Migrante, a charity in Rio Grande do Sul state. In Rio de Janeiro another group, Cáritas, is assisting seven Cuban doctors seeking refugee status. In the state of Paraná, three more have asked for help. "We will argue that if they go back they will be persecuted," said Fabrício Toledo, a lawyer for Cáritas in Rio. Getting official refugee status takes an average of two years, said Bernardo Laferté, the coordinator of the Brazilian National Committee for Refugees, the government body responsible for granting it. "In the United States, it takes six months. In Germany, it takes a year," said Laferté acknowledging the long wait times. Immigrants who file for refugee status can apply to work legally while waiting for their cases to be judged. Laferté believes many will do that and become legal residents even before final rulings in their applications, by finding jobs or starting families. Cubans in large urban centers often find jobs in hotels and other tourism-related businesses that value Spanish-speaking workers, Toledo, from Cáritas, said. The majority of Cuban doctors, however, practiced in poor and remote areas where Brazilian doctors refuse to work. Jobs are harder to find there. "I'm running out of money," said Olga, a doctor that applied for refugee status last week. She declined to use her real name out of fear of Cuban government reprisals. 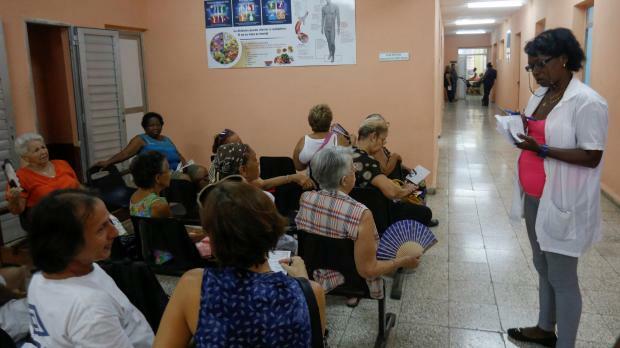 The Cuban doctors aren't allowed to open their own medical practices while they wait because their credentials aren't recognized by Brazil when practicing outside of the Cuban program. Olga shares an apartment with seven Cubans - three of them doctors seeking refugee status - in the small town where she used to work in the state of Rio. "He (Bolsonaro) did not lie, it is some sort of modern slavery," Olga said. "If I was to go back, I would have to work a lot for very little pay, and if Cuba needed me to go to another country, I would because I need the money. You have to travel to have money." To fill the vacancies left by Cubans, the Brazilian Health Ministry opened the postings to other foreign doctors early this month. The positions come with an exception that permits them to work without a diploma validated by Brazil. Those Cubans who stayed in Brazil are welcome to apply. Foreign doctors, however, will only be able to choose from job postings not filled by Brazilians. "All my hope is on this," said Olga, who applied Tuesday. "I'll take work wherever there are vacancies." For most Cubans, however, the last few weeks were not about job hunting, but preparing to return home. And the idea of being likened to slaves was offensive to some of the doctors interviewed by the Thomson Reuters Foundation. "We are slaves to no one. We worked here because we wanted to. No one was forced. We signed a contract knowing the conditions," said Inays Subanto, a Cuban doctor based in Rio Grande do Sul, as she waited to board a flight back to Cuba on Saturday. Another Cuban doctor, Jorge Lopez, who also returned to Cuba on Saturday added that he would rejoin the program to work in another country, if possible. "We were taught to work with our hearts, to do it out of love, not interest."